The City of Manila has announced that it will implement a truck ban from February 10, Monday. Trucks of at least 8-wheels and 4,500kg gross weight will not be allowed to travel in Manila’s roads from 5AM to 9PM. Manila’s City Ordinance No. 8336 calls for the daytime truck ban in the city in order to reduce traffic congestion that is perceived to be brought about by trucks. 8-wheelers are likely 3-axle trucks with a 4-wheel, 2-axle prime mover pulling a 1-axle, 4-wheel (double-tired) trailer. I am not aware of the technical basis for the ordinance. Perhaps the city has engaged consultants to help them determine the pros and cons of this daytime truck ban. I hope it is not all qualitative analysis that was applied here as logistics is quite a complicated topic. And such schemes in favor of passenger transport (and against goods movement) actually creates a big problem for commerce due to the challenges of scheduling that they have to deal with. To cope with this ordinance, companies would have to utilize smaller vehicles to transport goods during the daytime. This actually might lead to more vehicles on the streets as companies try to compensate for the capacity of the large trucks that will be banned from traveling during the restricted period by fielding smaller trucks. 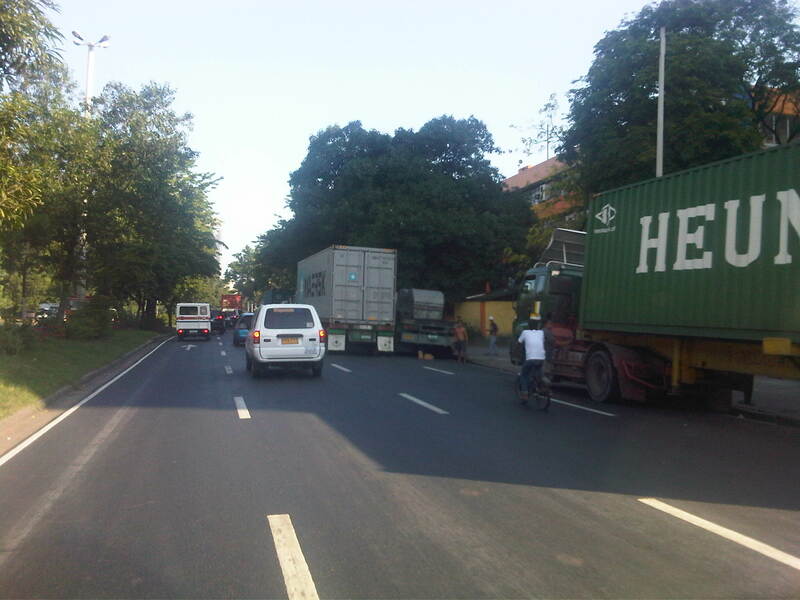 Trucks parked along Bonifacio Drive near the DPWH Central Office in Manila’s Port Area. By d0ctrine in Governance, Logistics, Policy, Ports, Traffic Management on February 12, 2014 .